Here we are going to discuss about data transfer instructions which move data between register or memory locations. This instruction is used to move the data from accumulator or memory to some registers or vice versa. This instruction is used to load the accumulator directly from the memory. This instruction is used to store the H & L registers directly to memory. Now we are going to see some data transfer instruction which deals with the register pair. To indicate the register pair we are using a term called ‘X’. This instruction is used to load the register pair with the immediate data. This instruction is used to load the accumulator with the data from address in register pair( 16 bit address). 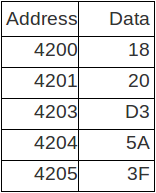 This instructions is used to store the accumulator in address in register pair. This instruction is used to exchange the data of H&L register pair with D&E register pair. This instruction is used to exchange the top of stack with H&L. Please put complete and comprehensive post of full instruction set soon.